This is the story of one woman whose made an exceptional difference in the life of every person shes touched. Not only did first grade teacher Amanda Eaton recently donate a kidney to save her dad’s life, she’s been nominated for the Teacher of the Year award. And her current and former students think the world of their prized teacher, whose always gone out of her way to be of help to them. One of her student’s parents even wrote a glowing letter about her to the Ellen DeGeneres show. Eaton ended up receiving a ticket to attend the program. Imagine her surprise when she found out that she wasn’t just going to be an audience member, but an honored guest. With her pillow in hand to help with the post-surgery pain and recovery process, Eaton’s eyes filled with tears as she watched a video that was put together by her school describing what makes her special. Eaton shares: “I have the luxury of being with people’s children more than they do during the work week and parents don’t hear that they’re doing a good job.” That’s why this favorite teacher makes a point of frequently calling parents not just to talk about academic troubles, but to let them know the wonderful things their children are doing. But beyond that, she has spent thousand of dollars of her own money buying food and clothing for students and families in need of a helping hand. On the show, Eaton shared one particularly touching story about a former student who she invited to lunch. But why wasn’t the girl eating, she wondered. After finding out that it was because the girl wanted to take the leftovers to her hungry family, Eaton bought enough food to feed them all. To thank Eaton for the love and kindness that she shows to her students, Ellen awarded her $5,000 cash and a check from Wells Fargo for $50,000, as part of their “Small is huge” campaign that honors individuals whose actions have a positive impact. 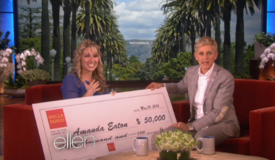 Good for You, Amanda Eaton, for teaching us all an inspiring lesson in giving!